人文學校從個把月前就已經開始籌備新春迎新年的活動, 今年不但有往年熱門的遊戲, 還增加了新的遊戲, 年節食品, 和環保活動, 寓教於樂, 更讓在海外長大的孩子沾沾年節的氣氛, 嚐嚐年節的食品, 還可以寫付春聯帶回家貼. 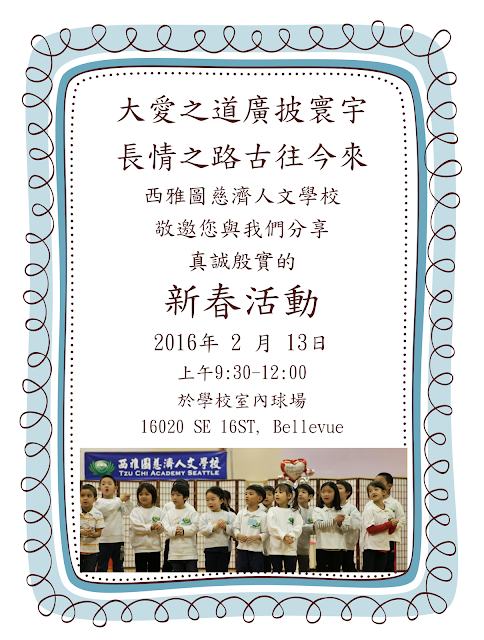 Year of Monkey is approaching, here at Tzu Chi Academy Seattle, parents & volunteers are working hard to plan out the celebration event for all of our kids. There will be lots of game & food booths, food items sale for fund raising, games to learn recycling correcting, games to show caring. Your family is cordially invited! 相信大多數的家長都知道 Tillicum School 今年暑假要拆掉重建, 所以我們新的學年度必須換學校, 再加上今年有許多的變數, 希望您們都有收到學校新的行事曆, 為了讓大家更清楚學校今明年的動向, 校方敬邀大家再次到學校來聽取說明並交流溝通, 讓家長們能很清楚的知道您孩子在學校的活動, 可以和孩子們同步成長. It was great to see all our students come back to school last Saturday. Due to upcoming events, school calendar and foreseeing changes in school, we would like to invite you all to attend another Parents & administrators meeting on coming Saturday, 1/16 10:30 AM, at school cafeteria. Being clear about what your students are doing at school shows strong support your student’s education. It is positive that your students greatly benefit from your support and presence at school as well. In life, not all balls are good throws. Only a seasoned player can make a hit every time.